Spit. Punch someone. Yell. Scream. Fight. Pummel. But….instead I will blog about it. It. It being the uninformed, presumptuous, pretentious opinions of one woman. And she felt so righteous she actually called into the local radio station to inform them of her ‘brilliant’ idea. While her intentions – I believe – are pure….her delivery and self-righteousness is ….beyond words. 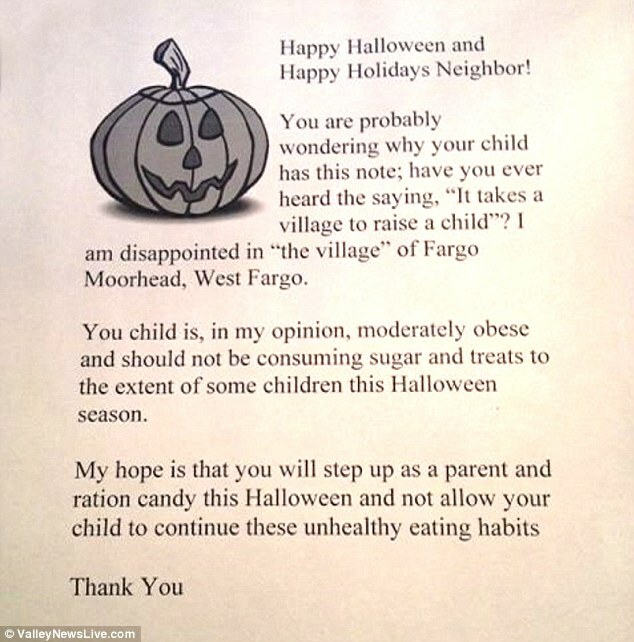 Here is what she is handing out to children she deems overweight. Not all the kids. Just the ones she deems too fat to be trick or treating. So were my spawn to walk to her door, she would reward my Second Eldest Spawn candy. She could potentially give Littlest this letter. Littlest eats salad. She willingly eats vegetables. She eats oatmeal. She actually asks for veggies WITHOUT dip. She enjoys hummus. She doesn’t LIKE potatoes. She knows to eat healthy foods and will make great choices. Second Eldest Spawn hates food. Let me rephrase that. She hates healthy, non-processed food. She would live on mac cheese from a box (she HATES my homemade version), bratwurst and chocolate covered granola bars. Littlest Spawn is 99% in weight and height. Second Eldest Spawn is 30% in weight and 20% in height. Littlest is the same height (give or take 1/2 inch) and weighs more than Second Eldest Spawn. Littlest is 5. Second Eldest is 8. So which one is more healthy? Which one deserves the letter? NEITHER ONE! NO ONE. Not one person deserves to be judged like that. I was a chunky kid. I was called Miss Piggy or the Garbage Disposal all the time. And I’m a chunky adult. People are too kind to call me names now. At least to my face. If I received this letter, my already non-existent self esteem would dive even lower. I would be heartbroken. When interviewed, ‘several experts’ said a letter like this could have a devastating effect on children already fighting battles. You show me a kid who is a bigger kid and I can guarantee they’re aware. Littlest was called the “Fat Kid” at preschool – she was 4. Four years old people. She was embarrassed to wear a pair of pants and then in tears when they wouldn’t button. They were size 3T and she was 4. They should not have fit anymore. They were from the previous winter. But she knew enough that she had grown and somewhere she got the idea it was bad. NO!!!! NO NO NO NO NO! And if my kid received this letter, Evil Joy may actually be EVIL. Because I’m feeling pretty evil about this right now. 24 hours after processing. I am so angry I’m shaking. Some poor kid could get this letter and just … gah. I saw this yesterday and told my friend Snarkfest about it. She was able to write this awesome post. I needed a day. I was so angry, I couldn’t even write any words that made sense. I shouldn’t even be justifying how Littlest and Second Eldest are different and the same. I shouldn’t have to. What do you think about this? What you do if your child received this letter? Would you ever hand out a letter like this? EJ out – to prepare for an awesome night for ALL my spawn to enjoy some fun and treats. If you’d be so kind as to click on the juggling lady over there in the corner, I’d be greatly appreciative. I’m falling in the ratings at Top Mommy Blogs and I’d love to move back up! Thanks!!! DO it Do it Do it Do it – you know you want to!